Thanks to those of you who took the Everyday Wear survey. It was very informative and your comments are insightful and amusing by turns. All-in-all a fine effort on everyone’s part. I’m not sure the best way to show you the results. I’ve monkeyed around with creating a slideshow, which is remarkably inelegant in execution, but at least gets you to the meat of the matter. Interesting, no? In general, I will say that you are a well-turned out crowd. Hoorah! Even the gentleman whose summer uniform consists of polo shirts and well-laundered seersucker trousers is displaying an easy elegance in my book. It’s a look I favour on weekends, usually with loafers or driving shoes. Nick wrote in with another comment that I think bears some attention. He quotes from “Fred Astaire” in describing American style as combining the aristocratic with the democratic losing the snobbery factor. He wonders if there is more ease to elegance than I suggest? The short answer is an ambivalent “sort-of.” When I’m loafing about I may choose a pair of well-worn khakis and a Brooks Brothers Oxford cloth button-down and my Sebago penny loafers for sheer comfort. It’s a laundry day staple. My tailored clothes fit well and are therefore incredibly comfortable. Astaire was a big fan of Savile Row and had the Sholte cut London Lounge/soft suit look perfected. He chose to dress down his suits with B2 button-downs and wore so much grey flannel that Audrey Hepburn had his photo framed in the stuff. Flannel, soft tailoring, loafers, neckerchiefs, that was all considered “casual” and is still far more dressed up than what you see today. After reading the results of the survey, I’m trying an experiment today, branching out into “casual” with which I can feel comfortable. I need comfort after a weekend of serious excess (and to get back to my regimen… up five pounds in three hedonistic weeks…) I’m also becoming less comfortable wearing clothing that is not precisely tailored and/or specifically made for me. Nothing feels as good. But, as far as shirts go… those OCBD’s are hard to beat. So WWCGD? Ralph Lauren OCBD, grey flannel MTM slacks, light grey socks, black penny loafers (J. Crew!) 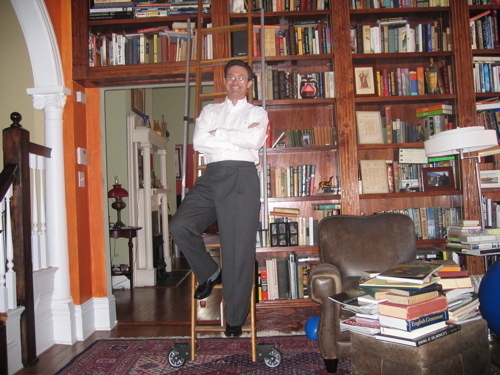 Even if the most athletic thing I’m going to do in them is climb the library ladder. 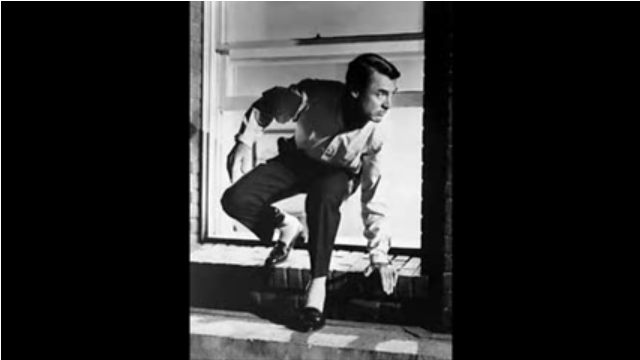 This entry was posted in Elegantology and tagged brooks brothers, Cary Grant, North By Northwest, OCBD, Ralph Lauren, Survey. Bookmark the permalink. 3 Responses to Survey Says…. ah, my work wardrobe lives! Hi Brian, thanks for weighing in. I’m curious, during the cooler months, do you top it off with a sportscoat or sweater? I will wear a sweater when it’s cold enough, but the sweater and tie look seems not much better than the Dilbert look to me: I feel like staff in a uniform. I am starting to wear a sportscoat when I need a jacket, but need to take it off when I’m in the office or I look like I’m trying to dress for the C suite.